Trains are my favourite mode of transport. My favourite thing about trains is that you can gaze out of the window and see the countryside rolling by. Imagine if you could exaggerate that so that all of the walls were made out of glass, or that through augmented reality I could be pointed to hidden cultural gems in the countryside, or even in the galleries of the towns I passed through. What would happen if trains had a remit for promoting culture and tourism? Where would that physically and mentally take us? Alternatively, what will happen when virtual reality immersive experiences that singers like Björk are using to share her work with large audiences are used by commuters to create a safe, secluded space on their way to work? If the experience of the 8:30am train is a carriage load of people swiping through their smartphones, what happens when they all have VR headsets on? This is the type of speculative exercise that you can do to start pushing at the boundaries of what the future might hold, and coming up with transformative ideas. Disclaimer alert: I am not saying that the Department for Culture, Media and Sport should have responsibility for rail travel, that Radio 4 should be live streamed from headrests or that we should ban VR in trains. But by jumping out to consider some wild card futures, we open up the space for fresh thinking in between. As Tobias Revell from research & design studio Strange Telemetry says, “the future can be a playground for creativity”. 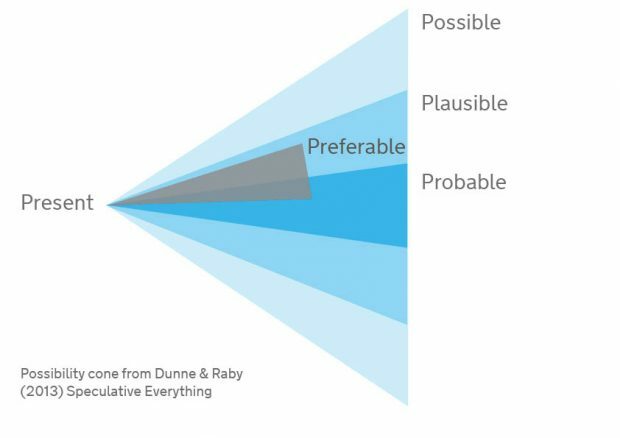 Speculative design is a way of considering not just probable or predictable futures (see image below from Anthony Dunne & Fiona Raby’s speculative everything) but a wider range of possible ones. Too often, Government just plans around preferable futures without consideration of alternatives. This approach goes beyond scenario planning, and creates actual objects or images from these future worlds. This provides something tangible for people to engage with. Up until now, speculative design has mostly been used by art and design institutions (universities, galleries) as a way of starting public debates about matter of concern. Last year, Policy Lab worked with GO-Science and Strange Telemetry (a design agency) to bring it into the UK Government for the first time on a project about an ageing society. We saw how it allowed public workshops to produce qualitative feedback on different futures, weighing up the trade-offs and tensions and allowing us to test policies that didn’t yet exist. So when DfT asked us to help them develop their understanding of what a passenger-focussed railway of the future might look like, we knew we had an innovative technique that worked. We started off by doing some film ethnography with rail passengers (and non-passengers) to understand their current experiences. What really stood out was the experience of stress and anxiety, illuminating the kinds of human experiences and emotions in a way that a passenger survey can’t. 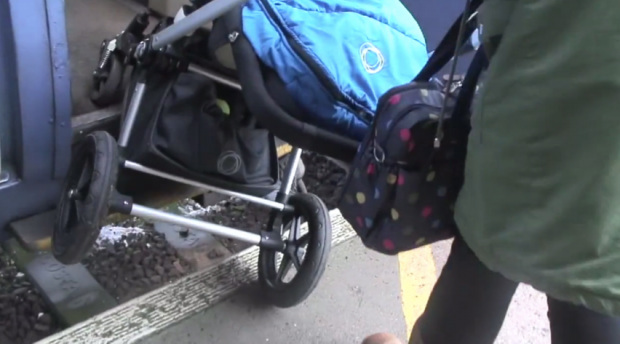 Not only did this reframe how DfT are developing their strategy, but it also allowed us to understand the everyday interactions people have with trains, staff and infrastructure. The speculations were testing some quite ‘back-stage’ or non-passenger facing policy decisions, such as open and digital data, investment in infrastructure, devolution. On their own, these are quite complex to think about. But the ethnography gave us vital clues as to how decisions here are felt by passengers, which we could then amend in future scenarios. We co-designed the speculations with stakeholders. 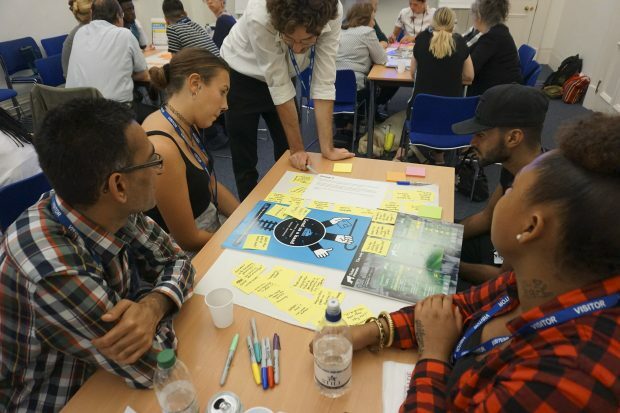 After finding out what DfT wanted to test (the key trends or factors that will influence policy decisions in the next 20 years), we ran workshops with rail stakeholders to think about how these would change experiences for passengers. Each group was given a persona and their typical journey, and some future trends (e.g. strong economy, devolution, flexible working, ageing society etc) and asked to create a future fiction. Strange Telemetry and Superflux (our design partners) then took these written descriptions and created some objects from them (e.g. a new network rail map, a ticket buying/selling app, electronic noticeboards for autonomous vehicles at rural stations, online magazines showing additional services). All the objects were ambiguous enough that there was room for the public to discuss and interpret them, which led to wider conversations about the pros and cons of the society in which they belonged, and how individuals and Government would need to act differently. We’ve used this public feedback on futures that do not yet exist to help develop DfT’s vision for rail, working out where the public would want us to go, and where they would not. Although the links between culture and rail might seemed far-fetched at first, perhaps they are closer than we think. As well as getting us from A to B, rail does have an important role to play in regeneration and tourism, sustainability and economic growth. And there are many ways to speculate how.